U.S. Export Strategy: The Saudi Arabia of Coal? The United States has been called “the Saudi Arabia of coal” since the energy crises of the 1970s; politicians of both parties have embraced this metaphor. It’s certainly true that both countries have more fossil fuel reserves than they can use for decades to come, located in their remote, empty regions; we call ours Wyoming. Coal use in the United States – almost exclusively for electricity production – is declining, thanks to competition from natural gas and wind power, along with stricter environmental regulation. This might seem like good news for the environment, but to the coal industry, it’s a looming disaster that can only be prevented by increased exports. Five new coal export terminals have been proposed in Oregon and Washington, leading to intense battles over the local and global impacts of increased coal shipments. At the same time, the huge recent increase in natural gas production, due to fracking of shale, means, according to the Wall Street Journal, that “Energy companies are racing to export natural gas from the U.S.” Even in oil, increases in production in both Texas and North Dakota have led to proposals to export both crude and refined products – despite the continuing massive imports of oil nationwide. What else does the United States export? 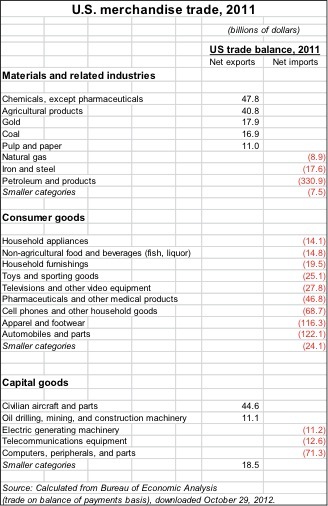 roughly balanced trade in capital goods, with net exports of aircraft, oil drilling and mining equipment, and a few smaller categories offset by net imports of computers, telecommunications, and other types of equipment. The United States also “exports” services (not shown in the table), receiving payments for royalties, financial services, tourism, and education; more international tourists and students come to the United States than from it. In 2011, the trade surplus in services was equal to about a fourth of the trade deficit in goods. This is a picture of an economy whose foreign trade is not thriving: All the brave talk during the Presidential campaign about American technology, the productivity of American workers, and future plans for competitiveness does not sit easily on the same page as these data. If a new boom in fossil fuel exports leads the United States further into dependence on raw material exports, it will only solidify the country’s emerging role as a supplier of materials to more successful industrial countries. Europe, Japan, and China have nothing like the U.S. level of material resources per capita – but they sure know how to make stuff out of the materials they import. To be fair, the U.S. trade data do not quite paint a picture of a Saudi-style economy. There are remaining pockets of strength in capital goods – particularly aircraft, a spinoff of military spending, and oil drilling and mining equipment, a spinoff of extractive industries. Some of the stronger materials industries, such as chemicals and paper, involve advanced industrial processing before the materials are exported. In some consumer goods industries, such as autos and pharmaceuticals, significant production continues in the United States despite a large net deficit in international trade. But the long-term trend in industrial competitiveness seems to be downward. Rather than the Saudi Arabia of coal, the United States might be the South Africa of the North. South Africa has a sizable but struggling industrial sector, powerful extractive industries based on exploiting the country’s vast coal and mineral deposits, extraordinary levels of inequality (which has a connection to the importance of extractive industries), and continuing difficulties in dealing with the nation’s legacy of racial injustice. What will it take for the United States to be more than the South Africa of the North? To regain competitiveness, it will be important to invest in strategic new technologies and industries; the Obama administration’s tentative steps in this direction have been almost abandoned following the bankruptcy of a small solar panel producer that had received federal loans. Active management of the economy is needed to prevent further decline. The auto bailout was essential; the bank bailout should have imposed much harsher terms on the big banks, and should have led to expanded access to credit for new industries and struggling homeowners. Above all, the decline in American coal use should be celebrated for the environmental triumph that it represents. We, our trading partners, and our descendants will be better off if we leave more coal in the ground. We will be forced, fortunately enough, to prosper through development of cleaner industries.